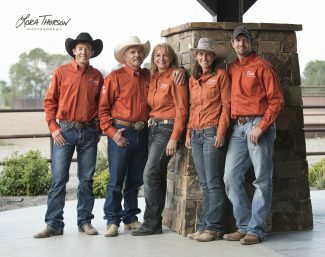 Tim and Mary O'Donnell, their son Cody and daughter Amber have been involved with horses their whole lives. Family and horses are the two most important components of their Quarter Horse breeding/training operation near Cardwell, Montana, a small town between Butte and Bozeman. 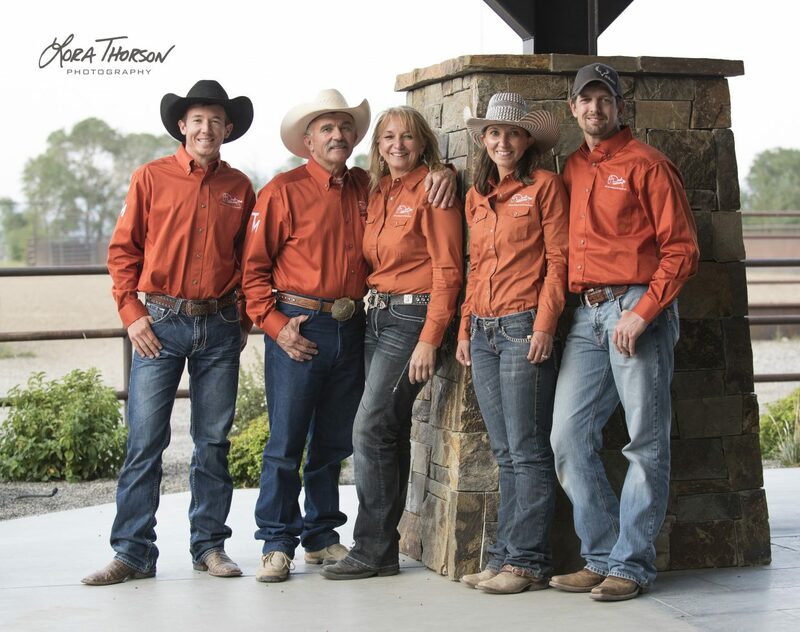 They started their horse breeding business 17 years ago, and turned their family passion for horses into a successful breeding program, as well as a way of life. "When Amber was in high school she wanted to barrel race," Tim says. "When we looked for a barrel horse I was amazed at how expensive they were. I'd bought her a horse a couple years earlier, so I told her to just use the horse she already had. Some of the older girls in our area took her under their wing and coached her. This was probably better than buying her a push-button barrel horse. She learned things the hard way, and did very well. She was able to start training for us and became a good hand." One of their neighbors bred speed horses. "He convinced me to buy his yearling stud colt called Toro the Blurr. Toro opened more doors for us. He was a son of Jet Toro out of a daughter of Murrtheblurr, and Amber did a lot of barrel racing on him." In March 2009 Cody (who was away college at that time) looked at the Billings Livestock website and noticed one of the stallions that would be in the horse sale. "He called me up and was all excited. That horse was an 11-year-old AAA son of Streakin Six, out of a daughter of Merridoc. He was the number 8 barrel horse sire in the nation," says Tim. "Mary and I went to the horse sale and bought the stallion, Finish Line Express. He's a speed bred horse; he has 102 speed index and won $55,000 on the track before we bought him. His maternal line is what we like to talk about, however. Merridoc goes back Tiny's Gay—a very prolific horse in the barrel racing world. Many people credit Tiny's Gay with the success of Dash Ta Fame. We are very proud of the maternal side of Finish Line Express," he says. "We bred almost all our mares to him and converted our program to barrel racing bloodlines—and discovered the power of good broodmares. Many people think that if you have a great stallion you'll have great colts." But it doesn't always happen that way. Tim feels that the mare has more influence than the stallion. "If you don't have a good mare, I don't care how good your stud is. You don't have anything without a good mare. So we built our program around our broodmares and mare lines. Cody has been the brains and driving force behind our breeding program. Our whole family has been involved in what we're doing," says Tim. The four of them are a very good team. "Mary has good business sense and takes care of that end of it and keeps us organized. She does the bookkeeping and our web page and tells people about our program through social media. Cody and I start the colts and got them going, and then Amber takes over with them," says Tim. Cody is always looking at various mare lines that he'd like to cross with their stallion. "We really like the Streakin Six bred horses. A lot of girls have gone to the NFR on Streakin Six horses. This is a bloodline that never goes out of style. Cow lines crossed with barrel speed lines makes for a lot of versatility." Cody is currently working for Kelly Conrado, in Colorado. "We're really missing him here, but he's learning a lot and it's good for him and his future in the barrel racing world. This is what our program is about, with barrel racing genetics," says Tim. "We only have about 10 mares. Quality, not quantity, is our goal. We've always put a lot of emphasis on maternal lines. Whether you are breeding horses, cattle, or dogs, the dam is more important than many people realize. I always tell people that it's because of my wife that my children are so good!" Buyers of O'Donnell horses have been impressed with their trainability, and this often goes back to the female lines. "We've experienced that with our horses that we started and trained, but we're also impressed with the way our stallion stamps his offspring with a good mind," Tim says. "Amber brought a world-class son-in-law into our operation 4 years ago. Her husband Josh Pulst is involved with the marketing and is part of the team. He picks up any loose ends that need to be taken care of, and supports Amber's barrel racing; she is traveling all over the country running barrels and he is behind her every step of the way." Even though Cody is now in Colorado he is still part of the team. "We are always communicating about breeding plans, and what to do with each horse. He has a lot of input in what we do. We hope he will come back after he's had some different experiences, and bring back more knowledge," Tim says. "Mary and I are getting older, and we trust that our program will go on—with Cody and Amber. Amber has several young horses she's working with now—a 3-year-old, a 5-year-old, and 7-year-old. She's running barrels on the 5-year-old this year. He's out of a Paddys Irish Whiskey mare we had, and coming on strong." He won his first saddle this year and picked up checks in several open barrel races. Amber and Josh live in Livingston Montana, and Amber is a surgical technician at Rocky Mountain Surgery Center. She puts in 48 hours a week there, but comes home every night and rides horses. "She's very dedicated. We're hoping eventually we'll have grandchildren, but right now she has goals to accomplish as a barrel racer," Tim says. The O'Donnell breeding program has attracted a lot of attention in the barrel world, through the success of their horses, and social media. "With just a click of a button you can touch hundreds of people. That's our primary marketing tool," he says. RACE TO THE FINISH LINE – "We've been producing a barrel race here for 8 years and it's become an epic event. We held it at the Circle L Arena at Belgrade for 4 years, until we outgrew that facility. Then we leased the Heart K Arena at Livingston (Heart K Land and Cattle). It's a 5-star world-class facility," Tim says. This race is the 2nd weekend in August each year. "This year we paid out more than $43,000 in cash and $15,000 in awards. When we first started we had 100 horses, and added $1000. Last year we had $10,000 added, and this year $11,000 cash added. We have some phenomenal sponsors! This year we had 325 horses running; it has been growing every year," says Tim. "We want this to be a premier event for the Northwest and not just a local in-state jackpot. We've had girls come from as far away as Alaska, Florida and Texas. This year there were many from Oregon, Utah, North and South Dakota. The girls that come tell us they will bring their friends the next year, and they do! We work hard to take care of the barrel racers because if they are happy it will be a good event. We are already working on next year's race. We do it because it's a marketing opportunity and more support for this sport. It gives these girls another opportunity to run, at a first-class event at a great facility." O'Donnells have met a lot of people in the barrel racing world and have friends all over the country. Their breeding program has been rewarding, in the wonderful people met over the years. As a rule, horse people are genuine and honest. "You can make a deal just with a handshake, looking them in the eye. You don't need a contract. We've done a lot of breedings and horse sales just on a handshake. To me, that's the best contract." Tim says. "We're a family-based business and it's been good to our family. It's been a great opportunity to work together. It's a way of life and we love it. When you see a nice set of colts in the springtime—the result of breeding decisions you made last year–it's very satisfying." "We also try to get our colts placed in the right hands. If I sell someone a horse for $10,000 and they just use it as a pasture ornament, that doesn't do me any good. I want to get my horses into the hands of people who will compete and showcase those horses. The competition is tough; there are a lot of good breeding programs in the barrel racing world, so it's important to get horses placed in the right hands. We have clients who are very serious about our horses and have great plans for them." Judy Myllymaki at Arlee, Montana has several O'Donnell horses and recently bred a mare to their stallion. "She's a huge player in the barrel racing world, competes all over the nation, and puts on barrel clinics. She's in her 70's and still goes around teaching clinics and runs horses in futurities in the winter down in Arizona. We are very happy that she has several of our horses," Tim says. Their stallion has had many very successful offspring. "We've enrolled some of them in some futurity programs, and this year is the first year in the Future Fortunes programs," says Cody. "This is one of the bigger futurity incentives right now and allows futurity riders to win incentive money at races that have their side pots," he says. SATISFIED CUSTOMERS – O'Donnell horses have been sold to many people in multiple states who appreciate the good minds, user-friendly disposition, athletic ability, speed and general athleticism of these horses. 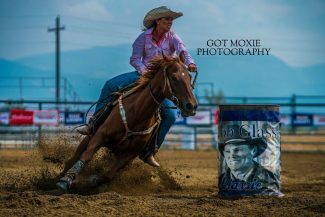 Amy and JR Winter at Stevensville, Montana have a 2-year-old they purchased as a yearling and now starting training on barrels. "We had a horse (now a 3-year-old) we started and sold to Janet Erickson," says JR. "She's going on with it to make a futurity horse. These horses are very athletic and very smart and willing," he says. "Finish Line Express is the sire of those horses we bought. They are full siblings, out of a cow-bred mare. That cross has worked out very well for us. We've gotten to know Tim and his family and they've been great to deal with —very fair," says JR.
His wife Amy also speaks highly of the O'Donnell breeding program. "JR and I come from a cutting and reining program, creating rope horses, etc. I used to train and show cutters and he trains and shows reiners. Then we entered the barrel world. We'd never been in the speed horse industry so we've tested a lot of race horse bloodlines to see what works and what doesn't work for barrel racing. We haven't found very many that work for us," she says. "We always want speed on cow—and preferably cow—in the mare. When we purchased horses from Tim and Mary we selected them out of cow-bred mares. The O'Donnells have done a really good job of putting speed, brains and cow together. We plan to buy some more," says Amy. "There's enough cow in those babies to allow trainability at a young age. If you breed speed to speed, you are usually looking at a much lower curve in terms of learning and trainability. The ones we bought from O'Donnells have really excelled. I recently took a video of the yearling we bought last year that's only had a year of training and he's riding around like a 4-year-old. That says a lot for JR as a trainer but it also says a lot for the brains and trainability of these youngsters," she explains. "AQHA speed horses are bred to run straight; they are not bred to think and have timing and be able to turn and really be athletic, so they are hard to train. But if you add the cow blood, especially in the mare, she teaches the baby a lot. They have the mind, and are built to do it. These are also big boned, big-footed colts. The 2-year-old we have right now is over 15.1 hands already and has a great stop." These horses are perfect for running barrels. "They do it naturally and effortless. They don't have to think about it; they have good work ethic and just do it. Coming from our background with performance horses that are the most broke and trained of any discipline, to come into barrel horses (which was new to us) we had to weed out certain bloodlines in order to produce good horses at young ages like we are used to producing." She and JR have rodeoed their whole lives and this is how they met the O'Donnell family. "I bought a horse trailer from Cody and he started telling us about his program and what his parents were doing, so we went to look at their horses. We ended up staying more than a day and came home with 3 horses," says Amy. "Good trainers are crucial in any industry, but when you have good blood to work with it makes everything easier. My husband is a gifted trainer and competitor; he can get on a horse and evaluate it quickly. He's been very pleased with the O'Donnell horses and enjoys riding and training them," she says. "They are great people. They've done a good job of researching and learning genetics and what to cross on what and how to put it all together. They have created an array of choices, to suit their customers. Their Finish Line stallion is unique because his babies are all very much alike. He puts consistency in his babies," says Amy. 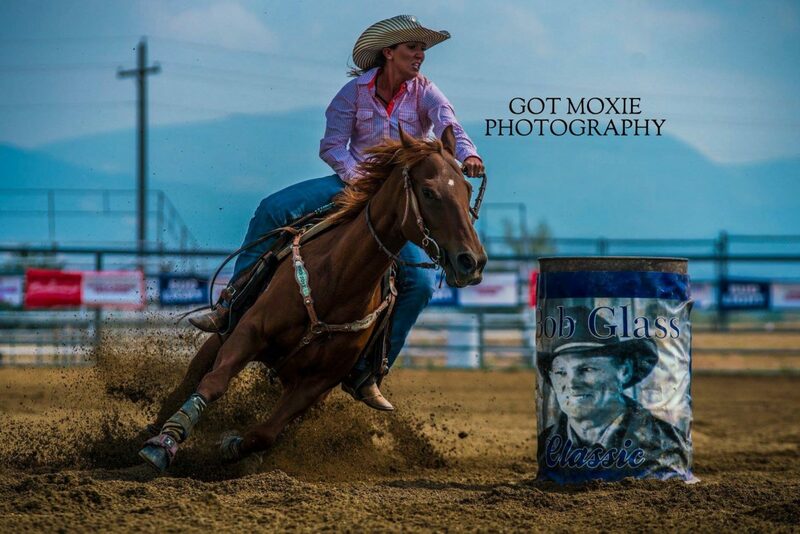 Grace Smith at Tendoy, Idaho has also been using O'Donnell bloodlines for her barrel horses. "We first bred a mare to their earlier stallion, Toro, and got a nice filly, then we bred mares to Finish Line Express. We really like that stallion. I have a weanling, a 2-year-old and a 3-year-old sired by him. I would have bred my mare again to that stud because it was such a great cross, except I lost her last spring and raised her foal on a bucket and a goat," she says. "If I was looking for a barrel horse to buy, O'Donnell horses would be the first place I'd look. They have some really good horses. I've been really pleased with those bloodlines, and this newest colt is exceptional. When we go to Arizona this winter we are taking the 2 and the 3-year-old to ride down there and work on their training. I have them both started and they've been around the barrel pattern, but I haven't done anything fast with them yet," says Grace. She competed several times at the event they put on at Livingston. "It's a really nice race and one of the bigger races that I go to. O'Donnells are the nicest and most honest people, and will help you any way they can. They've been really great to work with," she says.